The Island Spirit 40, designed and built in South Africa, has many of the characteristics people look for in an offshore boat: solid construction, simple, robust, and accessible systems, safe and efficient sailhandling gear, a roomy interior, a manageable price, and good sailing performance. On deck we liked the mainsheet/traveler system and the good visibility over the coachroof from the helm station. Some cats have the traveler up on an arch over the cockpit, but the Island Spirit&apos;s traveler runs across the coachroof, close at hand for the helmsman. The sidedecks are wide and easy to navigate, the deck hardware is high quality, and the elongated transoms make it easy to climb aboard. The cockpit is comfortable, and stowage is excellent. The interior is finished with a coat of white Awlgrip (there is no hull liner), and the plastic laminate teak-and-holly sole will be durable and easy to maintain; varnished cherry accents provide just the right amount of color and warmth. The cabins received good ratings for comfort, stowage space, headroom, and ventilation. We liked the stand-up nav station, which has a large chart table and ample room to mount electronics, but thought it would benefit from a proper nav seat. We also liked the beefy electrical system, which was designed with the demands of offshore passagemaking in mind. Like the rest of the boat, sailing performance was solid. Even with 10 people aboard, we logged decent speeds, had no trouble carrying speed through a tack, and sailhandling was trouble free. We had light winds for our test, but its good to know that every Island Spirit is delivered on its own bottom from Cape Town and thus undergoes a rigorous sea trial. Our verdict is simple: The Island Spirit 40 is an attractive, comfortable offshore cruiser that just happens to have two hulls. Price: $262,045 (base, FOB Annapolis, MD) includes Quantum full-batten main and radial genoa, aluminum rig, Andersen winches, 12-volt refrigerator/freezer, Autohelm ST5000 autopilot, Autohelm ST50 wind, depth, speed instruments, CD player, waterproof speakers, ground tackle and windlass, safety gear, delivery, and commissioning. U.S. agent: Trade Wind Yachts, Gloucester, VA; tel. 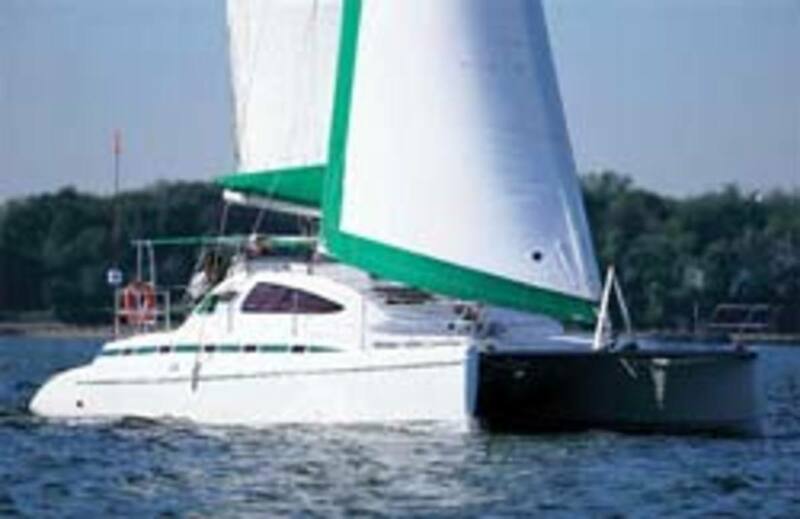 804-694-0881, www.tradewindyachts.com Construction: Hulls and deck are built of hand-laid fiberglass vacuum-bagged over a balsa core.